Even now, its shine and colour are magnetically alluring, its green surface, mottled with darker veins and glimmers of light, polished to a glassy sheen. The shape is beautifully balanced between sharp edges and elegant curves. It was once thought that it must have come from China, and if it looks exotic and mysterious now, it would have seemed astonishing nearly 6,000 years ago in Ireland. 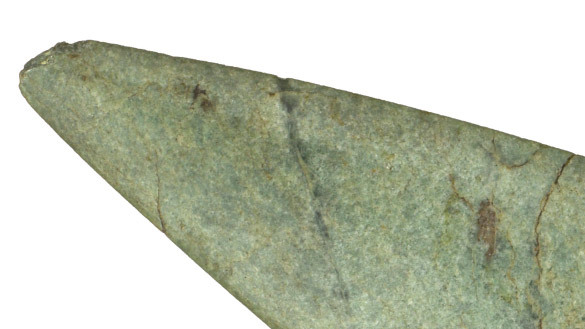 The jadeitite axehead, from Kincraigy, Co. Donegal, was never used to cut anything. It was always a rare and precious object, made not only to enhance the prestige of its owner but as a sacred thing in its own right. We now know just how exotic it was: in 2008 analysis revealed that it came from Monte Beigua, high in the Italian Alps near Genoa, over 1,600 km from its final resting place. It required enormous skill to make it, and it was already up to 700 years old when it reached Ireland in 3600 BC. The axehead tells us two big things. One is that prehistoric objects can have long and complicated life histories, and could travel incredible distances. This object had not travelled directly to Kincraigy from the source, but had circulated around north-west Europe. Its shape was changed and it received its glassy polish at some distance from the Alps, probably in the Paris Basin, some time between 4500 BC and 4000 BC. The people who brought it to Ireland will not have known where the Alps were, but they would have known that the axehead had come from the ‘magic mountains’, close to the world of the gods, far away. It would have had its own legendary history, perhaps even a name. The second big thing this object tells us is about agriculture, and the revolutionary changes that brought. Why is this ultra-special object an axehead? Because it was axes that allowed the dense woodlands to be cleared. The axe was the symbol of human power over nature. This piece of Italian exotica points us towards the single biggest transformation in Irish history: the adoption of farming around 4000 BC. This axehead was probably brought to Ireland by immigrant farming groups from northern France—coming either directly, or through Britain, and establishing a tangibly Continental lifestyle on our shores (similar jadeitite axes from Mount Viso in the Italian Alps were being imported into Britain, France, Denmark and Germany). The immigrant farmers would have had to bring their domestic animals and cereals with them, since the wild ancestors of wheat, barley, cattle and sheep did not exist on the island of Ireland. The axehead would have formed part of this package of novelties. It was probably a precious community heirloom, and its owners may have believed it could protect them during their long and dangerous journey. Once in Ireland, it would have been treasured before being deposited in a boggy spot. Mary Cahill of the National Museum believes that the axe may have passed from hand to hand as part of a ‘bride price’ or dowry. Farming created larger-scale settled communities with a strong sense of territory and ownership, and chieftains rich enough to own a fabulously exotic object.